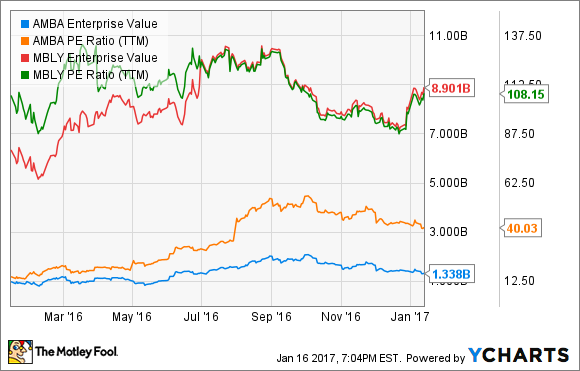 How Big Is the Automotive Opportunity at Ambarella Inc? The company's integration of VisLab is already bearing fruit. Ambarella (NASDAQ:AMBA) CEO Fermi Wang and CFO George Laplante recently spoke at the 19th Annual Needham Growth Conference. During a wide-ranging discussion, they touched on the topic of Ambarella's advances in the automotive industry and the possible role they may play in enabling self-driving cars. In July 2015, Ambarella acquired an Italy-based company consisting of 27 engineers called VisLab for $30 million in cash. The privately held VisLab was founded by University of Parma Professor Alberto Broggi and specialized in perception systems and autonomous vehicle research. The company had successfully demonstrated autonomous driving capability by having a vehicle complete a 13,000 kilometer autonomous trip from Italy to Shanghai in 2010. During last week's Needham Conference, the company gave a specific example of where VisLab's innovative software stack is being used in Ambarella product shipments today. Fermi Wang cited Ambarella SoCs sold to the home security market. One of the big problems with cloud-based security systems is recognizing when a false alarm has set off the system. Ambarella's solution, enabled by VisLab software, can have a camera react to a motion sensor signal and immediately look for a human figure. If none is detected, the camera goes off and the false alarm is eliminated -- the system can differentiate between a human and Fido the dog. A topic of interest at last week's conference during Q&A was Ambarella's plans to possibly compete in the autonomous automotive space with Israeli semiconductor company Mobileye N.V. Ambarella does not currently have an SoC for autonomous vehicles. The company's original automotive experience was centered around the aftermarket for dashboard cameras, but in the second half of this fiscal year, it began shipping SoCs directly to automotive OEMs. This is significant in that it helps forge a direct relationship between the automotive companies who are now making electronic mirrors native to vehicles. Secondarily, Ambarella now has SoCs that have passed AEC-Q100, the automotive reliability standard test for SOCs. When CEO Fermi Wang was asked directly for a schedule of chip introductions for autonomous vehicles, he said the company does not have and has not announced a product, and did not want to give any further guidance at that time. He did say that VisLab does have a complete software stack that will be incorporated into an Ambarella SoC that should be available in mid-2017. Whether this chip will be a component for an autonomous vehicle product was not clear. When a company has many ways to be successful, it is described as having optionality. In the case of Ambarella, investors tend to associate it with GoPro and wearable action cameras. A look at the company's revenue in the table below shows the other market segments that are significant contributors to its sales. These segments, along with the potential for an autonomous driving solution, provide for many ways that both the company and its investors may win aside from GoPro. Data source: Ambarella. Chart by author. By comparison, a company such as Mobileye is richly valued and has numerous agreements with automotive companies around its autonomous driving solutions. Investors are willing to pay up to own shares of Mobileye. Case in point, Mobileye has an enterprise value of $8.9 billion and trades at a trailing 12-month P/E of over 100, while Ambarella has an enterprise value of $1.3 billion and trades at a valuation of closer to 40 times earnings. Based on the current share price, it does not appear that today's market is giving Ambarella enough credit for potential product introductions in the autonomous vehicle space. That is where it could potentially surprise the industry going forward if it were to introduce a solution. Since the market does not appear to be ascribing any value to this effort, an investor who owns Ambarella shares may receive a significant upside surprise in the stock price if and when a product is announced. Even if the company never enters the space, other markets it serves may still reward the Foolish investor. In any case, watching Ambarella's progress will be interesting as its integration of VisLab's technology continues.